This article is about the men's football club from Milan, Italy. For the women's team, see A.C. Milan Women. For other sports teams called Milan, see Milan (disambiguation) § Sports. A.C. Milan's 18 FIFA and UEFA trophies is the fourth highest out of any club (joint with Boca Juniors), and the most out of any Italian club. Milan has won a joint record three Intercontinental Cups and one FIFA Club World Cup, seven European Cup/Champions League titles (Italian record), the UEFA Super Cup a joint record five times and the Cup Winners' Cup twice. With 18 league titles, Milan is also the joint-second most successful club in Serie A, along with local rivals Internazionale and behind Juventus (35 league titles). They have also won the Coppa Italia five times, and the Supercoppa Italiana seven. Milan's home games are played at San Siro, also known as the Stadio Giuseppe Meazza. The stadium, which is shared with city rivals Internazionale, is the largest in Italian football, with a total capacity of 80,018. Inter are considered their biggest rivals, and matches between the two teams are called Derby della Madonnina, which is one of the most followed derbies in football. The club is one of the wealthiest in Italian and world football. It was a founding member of the now-defunct G-14 group of Europe's leading football clubs as well as its replacement, the European Club Association. Saremo una squadra di diavoli. I nostri colori saranno il rosso come il fuoco e il nero come la paura che incuteremo agli avversari. We will be a team of devils. Our colours will be red like fire and black like the fear we will invoke in our opponents. A.C. Milan was founded as Milan Foot-Ball and Cricket Club in 1899 by English expatriates Alfred Edwards and Herbert Kilpin. 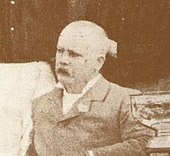 Although the club itself claims 16 December of that year as its foundation date, historical evidence show that the club was actually founded on 13 December. In honour of its English origins, the club has retained the English spelling of the city's name, as opposed to the Italian spelling Milano, which it was forced to bear under the fascist regime. Milan won its first Italian championship in 1901 and a further two in succession in 1906 and 1907. In 1908, Milan experienced a split caused by internal disagreements over the signing of foreign players, which led to the forming of another Milan-based team, F.C. Internazionale Milano. Following these events, Milan did not manage to win a single domestic title until 1950–51. The 1950s saw the club return to the top of Italian football, headed by the famous Gre-No-Li Swedish trio Gunnar Gren, Gunnar Nordahl and Nils Liedholm. This was one of the club's most successful periods domestically, with the Scudetto going to Milan in 1951, 1955, 1957, 1959 and 1962. In 1963, Milan won its first continental title by beating Benfica in the final of the European Cup. This success was repeated in 1969, with a 4–1 win over Ajax in the final, which was followed by the Intercontinental Cup title the same year. 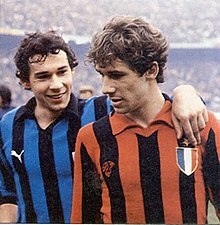 During this period Milan also won its first Coppa Italia, with victory over Padova in the 1967 final, and two European Cup Winners' Cups: in 1967–68 and 1972–73. Milan won a tenth league title in 1979, but after the retirement of Gianni Rivera in the same year, the team went into a period of decline. The club was involved in the 1980 Totonero scandal and as punishment was relegated to Serie B for the first time in its history. The scandal was centred around a betting syndicate paying players and officials to fix the outcome of matches. Milan achieved promotion back to Serie A at the first attempt, winning the 1980–81 Serie B title, but were again relegated a year later as the team ended its 1981–82 campaign in third-last place. In 1983, Milan won the Serie B title for the second time in three seasons to return to Serie A, where they achieved a sixth-place finish in 1983–84. On 20 February 1986, entrepreneur Silvio Berlusconi acquired the club and saved it from bankruptcy after investing vast amounts of money, appointing rising manager Arrigo Sacchi at the helm of the Rossoneri and signing Dutch internationals Ruud Gullit, Marco van Basten and Frank Rijkaard. The Dutch trio added an attacking impetus to the team, and complemented the club's Italian internationals Paolo Maldini, Franco Baresi, Alessandro Costacurta and Roberto Donadoni. Under Sacchi, Milan won its first Scudetto in nine years in the 1987–88 season. The following year, the club won its first European Cup in two decades, beating Romanian club Steaua București 4–0 in the final. Milan retained their title with a 1–0 win over Benfica a year later and was the last team to win back-to-back European Cups until Real Madrid's win in 2017. The Milan team of 1989–90, nicknamed the "Immortals" in the Italian media, has been voted the best club side of all time in a global poll of experts conducted by World Soccer magazine. After Sacchi left Milan in 1991, he was replaced by the club's former player Fabio Capello whose team won three consecutive Serie A titles between 1992 and 1994, a spell which included a 58-match unbeaten run in Serie A (which earned the team the label "the Invincibles"), and back-to-back UEFA Champions League final appearances in 1993, 1994 and 1995. A year after losing 1–0 to Marseille in the 1993 Champions League final, Capello's team reached its peak in one of Milan's most memorable matches of all time, the famous 4–0 win over Barcelona in the 1994 Champions League final. Capello's side went on to win the 1995–96 league title before he left to coach Real Madrid in 1996. In 1998–99, after a two-year period of decline, Milan lifted its 16th championship in the club's centenary season. Milan's next period of success came under another former player, Carlo Ancelotti. After his appointment in November 2001, Ancelotti took Milan to the 2003 Champions League final, where they defeated Juventus on penalties to win the club's sixth European Cup. The team then won the Scudetto in 2003–04 before reaching the 2005 Champions League final, where they were beaten by Liverpool on penalties despite leading 3–0 at half-time. Two years later, the two teams met again in the 2007 Champions League final, with Milan winning 2–1 to lift the title for a seventh time. The team then won its first FIFA Club World Cup in December 2007. In 2009, after becoming Milan's second longest serving coach with 420 matches overseen, Ancelotti left the club to take over as head-coach at Chelsea. During this period, the club was involved in the Calciopoli scandal, where five teams were accused of fixing matches by selecting favourable referees. A police inquiry excluded any involvement of Milan managers, but the Italian Football Federation (FIGC) unilaterally decided that it had sufficient evidence to charge Milan vice-president Adriano Galliani. As a result, Milan was initially punished with a 15-point deduction and was banned from the 2006–07 UEFA Champions League. An appeal saw that penalty reduced to eight points, which allowed the club to retain its Champions League participation. Following the aftermath of Calciopoli, local rivals Internazionale dominated Serie A, winning four Scudetti. However, with the help a strong squad boasting players such as Zlatan Ibrahimović, Robinho and Alexandre Pato joining many of the veterans of the club's mid-decade European successes, Milan recaptured the Scudetto in the 2010–11 Serie A season, their first since the 2003–04 season, and 18th overall. However, after the Scudetto the club declined in performance. It saw the club fail to qualify to European competitions for a few years. Fininvest, the holding company of the club also signed a preliminary agreement with Bee Taechaubol to sell 48% stake of the club for €480 million in 2015, after a net loss of €91.3 million in 2014 financial year and subsequent financial contribution from Fininvest. However, the deal collapsed. On 5 August 2016, a new preliminary agreement was signed with a Chinese investment management company Sino-Europe Sports Investment Management Changxing Co., Ltd. (Chinese: 中欧体育投资管理长兴有限公司), which Fininvest sold 99.93% stake of Milan for about €520 million, plus the refurbishment of the club financial debt of €220 million. (A further €90 million credit line from Fininvest was added to the valuation as the new debt was occurred between 1 July 2016 and the closing date). 0.07% stake of the club were retained by other shareholders. On 13 April 2017, the deal was completed and Rossoneri Sport Investment Lux became the new direct parent company of the club. In order to finalize the deal, American hedge fund Elliott Management Corporation provided Li with a loan of €303M (€180M to complete the payment to Finivest and €123M issued directly to the club). On 10 July 2018, Li failed to keep up with his loan repayment plan, neglecting to deposit a €32-million installment on time in order to refinance the €303-million loan debt owed to the American hedge fund. As a result, In July 2018, chairman Li Yonghong's investment vehicle Rossoneri Champion Inv. Lux. was removed as the shareholder of Rossoneri Sport Inv. Lux., the direct parent company of the club, making the investment vehicle majority controlled by Elliott Management Corporation the sole shareholder of Rossoneri Sport Inv. Lux. Milan qualified for the 2018–19 UEFA Europa League group stage as the sixth-placed team of the 2017–18 Serie A, but were originally banned by UEFA from European competition due to violations of Financial Fair Play regulations for failure to break-even. Milan appealed to the Court of Arbitration for Sport and was partially accepted on 20 July 2018; the court ordered UEFA to issue a proportionate disciplinary measure other than ban. The coat of arms of the city of Milan was the club badge of the first decades. Red and black are the colours which have represented the club throughout its entire history. They were chosen to represent the players' fiery ardor (red) and the opponents' fear to challenge the team (black). Rossoneri, the team's widely used nickname, literally means "the red & blacks" in Italian, in reference to the colours of the stripes on its jersey. Another nickname derived from the club's colours is the Devil. An image of a red devil was used as Milan's logo at one point with a Golden Star for Sport Excellence located next to it. As is customary in Italian football, the star above the logo was awarded to the club after winning 10 league titles, in 1979. For many years, Milan's badge was simply the Flag of Milan, which was originally the flag of Saint Ambrose. The modern badge used today represents the club colours and the flag of the Comune di Milano, with the acronym ACM at the top and the foundation year (1899) at the bottom. White shorts and black socks are usually worn as part of the home strip. Milan's away strip has always been completely white. It is considered by both the fans and the club to be a lucky strip in Champions League finals, due to the fact that Milan has won six finals out of eight in an all white strip (losing only to Ajax in 1995 and Liverpool in 2005), and only won one out of three in the home strip. The third strip, which is rarely used, changes yearly, being mostly black with red trimmings in recent seasons. I can't think of many shirts out there that are as recognisable as Milan's. – Our kits go beyond just the sphere of football. —  In an interview with SoccerBible, Milan player Gianluca Lapadula complimented the iconic design of Rossoneri. Wikimedia Commons has media related to A.C. Milan kits. at the end of the 2017–2018 season. The team's stadium is the 80,018 seat San Siro, officially known as Stadio Giuseppe Meazza after the former player who represented both Milan and Internazionale. The more commonly used name, "San Siro", is the name of the district where it is located. San Siro has been the home of Milan since 1926, when it was privately built by funding from Milan's president at the time, Piero Pirelli [it]. Construction was performed by 120 workers, and took 13-and-a-half months to complete. The stadium was owned by the club until it was sold to the city council in 1935, and since 1947, it has been shared with Internazionale when the other major Milanese club was accepted as joint tenant. The first game played at the stadium was on 19 September 1926, when Milan lost 6–3 in a friendly match against Internazionale. Milan played its first league game in San Siro on 19 September 1926, losing 1–2 to Sampierdarenese. From an initial capacity of 35,000 spectators, the stadium has undergone several major renovations, most recently in preparation for the 1990 FIFA World Cup when its capacity was set to 85,700, all covered with a polycarbonate roof. In the summer of 2008 its capacity has been reduced to 80,018, to meet the new standards set by UEFA. Based on the English model for stadiums, San Siro is specifically designed for football matches, as opposed to many multi-purpose stadiums used in Serie A. It is therefore renowned in Italy for its fantastic atmosphere during matches, largely thanks to the closeness of the stands to the pitch. The frequent use of flares by supporters contributes to the atmosphere but the practice has occasionally caused problems. On 19 December 2005, Milan vice-president and executive director Adriano Galliani announced that the club was seriously working towards a relocation. He stated Milan's new stadium will be largely based on the Veltins-Arena – the home of Schalke 04 in Gelsenkirchen – and will follow the standards of football stadiums in the United States, Germany and Spain. As opposed to many other stadiums in Italy, Milan's new stadium would likely be used for football only, having no athletics track. On 11 December 2014, Barbara Berlusconi announced a proposal to build a property stadium of 42,000 seats in Portello, behind the new HQ of the Rossoneri, and the large square "Piazza Gino Valle". The new village with shopping malls and hotel is located near CityLife district and is served by the metro. On 20 September 2015, however, Silvio Berlusconi called an end to his club's plans to build a new stadium in the city. In 2017, new CEO Marco Fassone stated that the club may look at either staying in the San Siro or moving to a new stadium with the club hierarchy emphasizing the need to increase average attendance for home games. Scene of a Derby della Madonnina in 1915. Milan is one of the best supported football clubs in Italy, according to research conducted by Italian newspaper La Repubblica. Historically, Milan was supported by the city's working-class. On the other hand, crosstown rivals Internazionale were mainly supported by the more prosperous middle-class. The oldest ultras groups in all of Italian football, Fossa dei Leoni, originated in Milan. Currently, the main ultras group within the support base is Brigate Rossonere. Politically, Milan ultras have never had any particular preference, but the media traditionally associated them with the left-wing, until recently, when Berlusconi's presidency somewhat altered that view. According to a study from 2010, Milan is the most supported Italian team in Europe and seventh overall, with over 18.4 million fans. It had the ninth highest average attendance of European football clubs during the 2010–11 season, behind Borussia Dortmund, Barcelona, Manchester United, Real Madrid, Bayern Munich, Schalke 04, Arsenal and Hamburger SV. Genoa fans consider Milan a hated rival after Genoa fan Vincenzo Spagnolo was stabbed to death by a Milan supporter in January 1995. Milan's main rivalry, however, is with its neighbour club, Internazionale, where both clubs meet in the widely anticipated Derby della Madonnina twice every Serie A season. The name of the derby refers to the Blessed Virgin Mary, whose statue atop the Milan Cathedral is one of the city's main attractions. The match usually creates a lively atmosphere, with numerous (often humorous or offensive) banners unfolded before the start of the game. Flares are commonly present and contribute to the spectacle but they have occasionally led to problems, including the abandonment of the second leg of the 2004–05 Champions League quarter-final match between Milan and Inter on 12 April 2005, after a flare thrown from the crowd by an Inter supporter struck Milan goalkeeper Dida on the shoulder. The rivalry with Juventus F.C. is a rivalry between the two most titled teams in Italy. The challenge confronts also two of the clubs with greater basin of supporters as well as those with the greatest turnover and stock market value in the country. The match-ups between Milan and Juventus, is regarded as the championship of Serie A, and both teams were often fighting for the top positions of the standings, sometimes even decisive for the award of the title. Milan also have rivalries with Roma and Fiorentina. Milan is one of the most successful clubs in Italy, having won a total of 30 domestic honours, in addition to their continental successes. Milan has earned the right to place a star on its jersey in recognition of the fact that it has won at least ten scudetti. In addition, the club is permanently allowed to display a multiple-winner badge on its shirt as it has won more than five European Cups. Paolo Maldini holds the records for both total appearances and Serie A appearances for Milan, with 902 official games played in total and 647 in Serie A (as of 31 May 2009, not including playoff matches), the latter being an all-time Serie A record. Swedish forward Gunnar Nordahl scored 38 goals in the 1950–51 season, 35 of which were in Serie A, setting an Italian football and club record. He went on to become Milan's all-time top goalscorer, scoring 221 goals for the club in 268 games. He is followed in second place by Andriy Shevchenko with 175 goals in 322 games, and Gianni Rivera in third place, who has scored 164 goals in 658 games. Rivera is also Milan's youngest ever goalscorer, scoring in a league match against Juventus at just 17 years. Legendary tactician Nereo Rocco, the first proponent of catenaccio in the country, was Milan's longest-serving head coach, sitting on the bench for over nine years (in two spells) in the 1960s and early 1970s, winning the club's first European Cup triumphs. Italian Prime Minister Silvio Berlusconi, who purchased the club in 1986, is Milan's longest-serving president (23 years, due to a two-year vacancy between 2004 and 2006). The first official match in which Milan participated was in the Third Federal Football Championship, the predecessor of Serie A, losing 3–0 to Torinese. Milan's largest ever victory was 13–0 against Audax Modena, in a league match at the 1914–15 season. Its heaviest defeat was recorded in the league at the 1922–23 season, beaten 0–8 by Bologna. During the 1991–92 season, the club achieved the feature of being the first team to win the Serie A title without losing a single game. Previously, only Perugia had managed to go unbeaten over an entire Serie A season (1978–79), but finished second in the table. In total, Milan's unbeaten streak lasted 58 games, starting with a 0–0 draw against Parma on 26 May 1991 and coincidentally ending with a 1–0 home loss to Parma on 21 March 1993. This is a Serie A record as well as the third-longest unbeaten run in top flight European football, coming in behind Steaua București's record of 104 unbeaten games and Celtic's 68 game unbeaten run. Since 2007, along with Boca Juniors, Milan has won more FIFA recognised international club titles than any other club in the world with 18 titles. They were overtaken by Al Ahly SC from Egypt after their 2014 CAF Confederation Cup win. The sale of Kaká to Real Madrid in 2009 broke the eight-year-old world football transfer record held by Zinedine Zidane, costing the Spanish club €67 million (about £56 million). That record, however, lasted for less than a month, broken by Cristiano Ronaldo's £80 million transfer. This record, however, is in terms of nominal British pound rates, not adjusted to inflation or the real value of the euro. Madrid bought Zidane for €77.5 million in 2001, about £46 million at that time. For recent transfers, see 2018–19 A.C. Milan season. * Might be restored for one of his two sons, should either of them play professionally for the club. Former player Gennaro Gattuso is the current manager of the club. As of 29 November 2017. Milan has had numerous chairmen[nb 1] over the course of its history, some of whom have been owners of the club while others have been honorary chairmen. Here is a complete list of them. Below is a list of Milan coaches from 1900 until the present day. On 11 June 2018 Milan announced the creation of Milan Women team by acquiring the Women's Serie A licence of Brescia Calcio Femminile. On 13 April 2017 Milan became a subsidiary of Rossoneri Sport Investment Luxembourg, which acquired 99.92973% shares of A.C. Milan S.p.A. from Fininvest. Li Yonghong became the new chairman[nb 1] and Marco Fassone was confirmed as CEO. The other members of the board of directors were Roberto Cappelli, David Han Li, Lu Bo (Chinese: 路博 of Haixia Capital), Marco Patuano, Paolo Scaroni and Xu Renshuo. (Chinese: 许仁硕) However, Li Yonghong's investment vehicle was removed as the shareholder of Rossoneri Sport Investment Luxembourg on 10 July after defaulted in a pledge to Elliott Management Corporation, which lent a large sum of money to Li in 2017 to finalize the acquisition. Other partners of Elliott were Arena Investors and Blue Skye, according to news reports. Elliott nominated new board of directors for both Rossoneri Sport Investment Luxembourg and Milan, with Paolo Scaroni as the new chairman (Italian: presidente) of the board of Milan and interim CEO. The four previous Chinese member of the board and former CEO Marco Fassone were all dismissed. According to The Football Money League published by consultants Deloitte, in the 2005–06 season, Milan was the fifth-highest earning football club in the world with an estimated revenue of €233.7 million. However, it fell to eighth in 2011–12 season, tenth in 2012–13 and twelfth in 2013–14 season. The club is also ranked as the eighth-wealthiest football club in the world by Forbes magazine as of 2014[update], making it the wealthiest in Italian football, just surpassing ninth-ranked Juventus by a narrow margin. Emirates is the current main sponsor for Milan's shirt starting from the 2010–11 season and through to the 2019–20 season. This follows a four-year relationship with Austrian online betting company bwin.com as sponsor. Previously, German car manufacturer Opel (owned by General Motors) had sponsored Milan for 12 seasons. For most of those 12 years, "Opel" was displayed on the front of the shirt, but in the 2003–04 and the 2005–06 seasons respectively, "Meriva" and "Zafira" (two cars from the company's range) were displayed. The current shirts are supplied by Puma. Previously it was supplied by German sportswear manufacturer Adidas, whose deal was scheduled to run until 2023. The deal made Adidas the official manufacturer of all kits, training equipment and replica outfits. However, an early termination of the deal was announced in October 2017, effective on 30 June 2018. Prior to Adidas, the Italian sports company Lotto produced Milan's sportswear. As a consequence of the aggregate 2.5-year financial result in the reporting periods ending at 31 December 2015, 31 December 2016 and 30 June 2017 (a FFP-adjusted net loss of €146 million, €121 million in excess of the acceptable deviation in the regulation:9), Milan was initially banned from European competitions due to breach in UEFA Financial Fair Play Regulations. However, the European ban was lifted by an appeal to the Court of Arbitration for Sport. Milan was allowed to achieve the break even condition on or before 30 June 2021. Milan had a team in the Superleague Formula race car series where teams are sponsored by football clubs. Robert Doornbos, formerly driving for Minardi and Red Bull Racing in the Formula One World Championship, drove for Milan in 2008. Doornbos won his first race for the team at Nürburgring, Germany. Giorgio Pantano is driving for Milan in the 2009 season and he has also won races for the team. The team folded in 2010 along with the series in 2011. ^ a b the Italian word for chairman of the board of directors was Presidente. However, it was not equal to the English meaning of president of a company. ^ "Organisational chart". acmilan.com. Associazione Calcio Milan. Archived from the original on 7 October 2010. Retrieved 4 October 2010. ^ "Elliott Management owns AC Milan after Li misses deadline". The Washington Post. 11 July 2018. Archived from the original on 11 July 2018. Retrieved 22 July 2018. ^ "Comunicato stampa congiunto Fininvest e Rossoneri Sport Investment Lux" [Fininvest and Rossoneri Sport Investment Lux joint press release] (PDF). fininvest.it (in Italian). 13 April 2017. Retrieved 13 April 2017. ^ "Who we are". APAMilanAC. Retrieved 22 July 2018. ^ a b c d e "History". acmilan.com. Associazione Calcio Milan. Archived from the original on 7 October 2010. Retrieved 4 October 2010. ^ a b Neil Heath (17 November 2009). "AC Milan's Nottingham-born hero". BBC. Retrieved 4 October 2010. ^ Conn, Tom (21 December 2014). "Real Madrid match A.C. Milan and Boca Juniors with 18 international titles". Inside Spanish Football. Archived from the original on 22 December 2014. Retrieved 22 December 2014. ^ "Milan loses the throne. Al Ahly is the most successful club in the world". Football Magazine. 22 February 2014. Retrieved 22 December 2014. ^ a b c d e f g h i j k "Honours". acmilan.com. Associazione Calcio Milan. Archived from the original on 7 October 2010. Retrieved 4 October 2010. ^ "Albo d'oro". legaseriea.it (in Italian). Lega Nazionale Professionisti Serie A. Archived from the original on 18 October 2010. Retrieved 4 October 2010. ^ "Struttura". sansiro.net (in Italian). San Siro. Archived from the original on 12 June 2010. Retrieved 4 October 2010. ^ "Is this the greatest derby in world sports?". Theroar.com.au. 26 January 2010. Retrieved 28 September 2011. ^ a b "Soccer Team Valuations". forbes.com. Forbes. 30 April 2008. Archived from the original on 29 September 2010. Retrieved 4 October 2010. ^ "ECA Members". ecaeurope.com. European Club Association. Archived from the original on 4 June 2010. Retrieved 4 October 2010. ^ "La nascita di un mito" [The birth of a myth]. Maglia Rossonera (in Italian). Retrieved 18 September 2017. ^ "Inter – History". F.C. Internazionale Milano. Archived from the original on 30 January 2010. Retrieved 11 January 2010. ^ "Champions League 1962/63". acmilan.com. Associazione Calcio Milan. Archived from the original on 26 November 2010. Retrieved 4 October 2010. ^ a b Dan Warren (25 July 2006). "The worst scandal of them all". BBC Sport. Retrieved 4 October 2010. ^ "The great European Cup teams: Milan 1989–90". The Guardian. 24 May 2013. Retrieved 7 June 2013. ^ a b "Longest unbeaten runs in European league football". UEFA. 4 February 2016. Retrieved 3 June 2017. ^ "Brazil's 1970 winning team voted best of all time". Reuters. 9 July 2007. Retrieved 30 September 2011. ^ a b c "Fabio Capello". A.C. Milan. Archived from the original on 16 June 2013. Retrieved 7 June 2013. ^ 161385360554578 (15 February 2012). "The Milan team with a BETTER record than Arsenal's unbeaten side – remembering AC Milan's very own Invincibles". talkSPORT. Retrieved 24 February 2019. ^ a b c "Teams of the Decade #14: Milan 2002–07". Zonal Marking. 22 January 2010. Retrieved 7 June 2013. ^ "2006/07: Milan avenge Liverpool defeat". UEFA. Archived from the original on 19 April 2010. Retrieved 23 March 2010. ^ a b "Carlo Ancelotti". A.C. Milan. Retrieved 7 June 2013. ^ "Calciopoli: The sentences in full". Channel 4. 14 July 2006. Archived from the original on 17 July 2007. Retrieved 30 July 2006. ^ Hughes, Rob (3 October 2006). "Soccer: Odor of corruption from root of game". International Herald Tribune. London. Retrieved 16 May 2011. ^ "Punishments cut for Italian clubs". BBC Sport. 25 July 2006. Archived from the original on 22 August 2006. Retrieved 30 July 2006. ^ "AC Milan win 2010–11 Serie A title". Goal.com. 7 May 2011. Retrieved 28 September 2011. ^ "How AC Milan won the Serie A title". Goal.com. 8 May 2011. Retrieved 28 September 2011. ^ "FININVEST – MR. BEE TAECHAUBOL" (PDF) (in Italian). Fininvest. 30 September 2015. Retrieved 15 August 2016. ^ a b "CASA MILAN, BILANCIO APPROVATO" (Press release) (in Italian). A.C. Milan. 28 April 2015. Retrieved 28 April 2015. ^ a b "Comunicato congiunto Fininvest-Rossoneri Sport Inv.Lux - CLOSING AC MILAN" (PDF). Fininvest. 13 April 2017. Retrieved 13 April 2017. ^ Furgiuele, Marcello. "Milan in Chinese hands: A closer look at the acquisition of AC Milan". Calcio e Finanza. Archived from the original on 3 May 2017. Retrieved 22 September 2018. ^ "Berlusconi Completes Sale of A.C. Milan Soccer Club to Chinese Investor". 13 April 2017. ^ "The final countdown – Yonghong Li must pay €32 million today or lose Milan". CalcioMercato.com. 6 July 2018. ^ "Elliott Ushers in New Chapter at AC Milan". Business Wire. 10 July 2018. ^ "Cda Milan, usciranno i quattro membri cinesi: Yonghong Li, Han Li, Renshuo Xu e Bo Lu". MilanNews.it (in Italian). 11 July 2018. ^ "CFCB Adjudicatory Chamber renders AC Milan decision". CFCB Adjudicatory Chamber (Press release). UEFA. 27 June 2018. Retrieved 29 June 2018. ^ "Milan in Europa League: accolto il ricorso al Tas". Corriere dello Sport (in Italian). 20 July 2018. Retrieved 21 July 2018. ^ "AC Milan v. UEFA: CAS annuls the sanction and refers the case back to UEFA to issue a proportionate disciplinary measure" (PDF). Court of Arbitration for Sport. 20 July 2018. Retrieved 21 July 2018. ^ "A.C. Milan – Sevilla FC" (PDF). UEFA.com. Union of European Football Associations (UEFA). 25 July 2007. ^ a b c "A.C. Milan". Weltfussballarchiv. 25 July 2007. ^ "ADIDAS AND AC MILAN PRESENT 2013–14 AWAY JERSEY". acmilan.com. ^ "In Conversation | Gianluca Lapadula". SoccerBible. 18 May 2017. Retrieved 21 November 2018. ^ "PUMA AND AC MILAN ANNOUNCE LONG-TERM PARTNERSHIP" (Press release). A.C. Milan. 12 February 2018. Retrieved 26 April 2018. ^ "AC Milan sign deal with PUMA". ESPN FC. 12 February 2018. Retrieved 26 April 2018. ^ "Ecco il nuovo stadio del Milan Arena da 42 mila posti al Portello". Corriere della Sera. 11 December 2014. ^ "AC Milan to stay at San Siro after scrapping plans to build new stadium". espnfc.us. 11 September 2015. ^ "FASSONE: "INVESTMENT AND ENTERTAINMENT OUR AIMS"". ^ "Research: Supporters of football clubs in Italy". La Repubblica official website (in Italian). August 2007. ^ a b "AC Milan vs. Inter Milan". FootballDerbies.com. 25 July 2007. ^ a b c "Italian Ultras Scene". View from the Terrace. 29 June 2007. Archived from the original on 18 June 2008. ^ "AC Milan". SportsPundit.com. 25 July 2007. ^ "AC Milan". Extra-Football.com. 25 July 2007. Archived from the original on 11 October 2007. ^ Ranking of European teams supporters: Barcelona first with 57.8 million, followed by Real Madrid (31.3 million), Manchester United (30.6 million), Chelsea (21.4 million), Bayern Munich (20.7 million) and Milan (18.4 million). "Tifo: Barcellona la regina d'Europa" (in Italian). sportmediaset.mediaset.it. 9 September 2010. Archived from the original on 10 September 2010. Retrieved 10 September 2010. "Calcio, Barcellona club con più tifosi in Europa, Inter 8/a" (in Italian). la Repubblica. 9 September 2010. Retrieved 10 September 2010. ^ "German Bundesliga Stats: Team Attendance – 2010–11". ESPN Soccernet. ^ "Camp Nou: Average attendance 79,390". fcbarcelona.cat. ^ "Barclays Premier League Stats: Team Attendance – 2010–11". ESPN Soccernet. ^ "Spanish La Liga Stats: Team Attendance – 2010–11". ESPN Soccernet. ^ "Italian Serie A Stats: Team Attendance – 2010–11". ESPN Soccernet. ^ "Genoa Bans Milan Fans From Sunday Match". ItalyMag.co.uk. 29 June 2007. Archived from the original on 11 October 2007. ^ "Milan game ended by crowd trouble". BBC Sport. 25 July 2007. ^ "The History of Clasico". Serie A TIM on Facebook.com. Retrieved 20 November 2015. ^ "Milan-Juve in Field History". acmilan.com. Retrieved 22 November 2012. ^ "Top 5 UEFA's Badge of Honour Winners". About.com. 25 July 2007. Archived from the original on 16 November 2006. ^ "Maldini infinito: e sono 600" (in Italian). Gazzetta dello Sport. 14 May 2001. Retrieved 14 January 2010. ^ "Maldini sets new Serie A record". BBC Sport. 25 July 2007. ^ "AC Milan". Channel4.com. 25 July 2007. ^ "Milano History and Records". Milanista Olympia. 25 July 2007. Archived from the original on 31 March 2006. ^ Edwards, Piers (25 July 2007). "Unbeaten half-century for Ahly". BBC Sport. Retrieved 13 November 2010. ^ "Meteb's injury-time goal gives Ahly final triumph". CAF. 6 December 2014. ^ a b "2009 Bilancio" [2009 annual report] (PDF) (in Italian). A.C. Milan. Archived from the original (PDF) on 10 July 2012. Retrieved 5 August 2011. ^ "Kaka joins Real Madrid in world record $89 million transfer". Inquisitr.com. 9 June 2009. Retrieved 12 December 2010. ^ "Ronaldo bid accepted". Manchester united F.C. 11 June 2009. Retrieved 5 June 2015. ^ "Zidane al Real" (in Italian). Juventus F.C. 9 July 2001. Archived from the original on 6 August 2001. Retrieved 15 September 2011. ^ "Reports and Financial Statements at 30 June 2002" (PDF). Juventus F.C. 28 October 2002. Archived from the original (PDF) on 7 June 2015. Retrieved 10 May 2012. ^ "First Team 2018/19". acmilan.com. Associazione Calcio Milan. Retrieved 24 January 2019. ^ "Official announcement: Tiémoué Bakayoko". acmilan.com. Associazione Calcio Milan. 14 August 2018. Retrieved 14 August 2018. ^ "Official: Kessié is now red and black". acmilan.com. Associazione Calcio Milan. 2 June 2017. Retrieved 2 June 2017. ^ "Comunicato ufficiale: Gabriele Bellodi" [Official statement: Gabriele Bellodi]. acmilan.com (in Italian). Associazione Calcio Milan. 17 August 2018. Retrieved 19 August 2018. ^ Sica, Stefano (31 August 2018). "UFFICIALE: Monza, arriva il giovane Brusa dal Milan" [OFFICIAL: Monza, youngster Brusa joins from Milan]. TuttoMercatoWeb (in Italian). Retrieved 31 August 2018. ^ "Benvenuto a Gian Filippo Felicioli" [Welcome Gian Filippo Felicioli]. acperugiacalcio.com (in Italian). Associazione Calcistica Perugia Calcio. 31 July 2018. Retrieved 31 July 2018. ^ "Super colpo per la difesa rossonera: arriva dal Milan il giovane Matteo Gabbia" [Great hit for the red-and-black defence: youngster Matteo Gabbia joins from Milan]. asluccheselibertas.com (in Italian). Associazione Sportiva Lucchese Libertas 1905. 31 August 2018. Retrieved 31 August 2018. ^ "Official statement: Gustavo Gómez". acmilan.com. Associazione Calcio Milan. 4 August 2018. Retrieved 13 August 2018. ^ a b "Due gioielli milanisti vestiranno l'arancione: ecco Llamas e Forte!" [Two Milanisti gems are wearing orange: here are Llamas and Forte!]. palmeiras.com.br (in Italian). Unione Sportiva Pistoiese 1921. 10 August 2018. Retrieved 10 August 2018. ^ "Official statement: Stefan Simić". acmilan.com. Associazione Calcio Milan. 24 January 2019. Retrieved 24 January 2019. ^ "Calciomercato" [Transfer-market]. legab.it (in Italian). Lega B. Retrieved 19 August 2018. ^ "Roman Macek vestirà bianconero, in arrivo anche Cavagnera" [Roman Macek will wear black-and-white, Cavagnera will join as well]. fclugano.com (in Italian). Football Club Lugano. 31 August 2018. Retrieved 31 August 2018. ^ "Official statement: Manuel Locatelli". acmilan.com. Associazione Calcio Milan. 13 August 2018. Retrieved 13 August 2018. ^ "Transfer Market – Torino". legaseriea.it. Lega Serie A. Retrieved 19 August 2018. ^ "Comunicato ufficiale: Tommaso Pobega" [Official statement: Tommaso Pobega]. acmilan.com (in Italian). Associazione Calcio Milan. 23 August 2018. Retrieved 23 August 2018. ^ "Official statement: André Silva". acmilan.com. Associazione Calcio Milan. 11 August 2018. Retrieved 11 August 2018. ^ Castagna, Daniele (29 August 2018). "Milan, il giovanissimo Fabozzi in prestito al Fenegrò" [Milan, youngster Fabozzi on loan to Fenegrò]. Milan News (in Italian). Retrieved 31 August 2018. ^ "UFFICIALE: Milan, Halilovic in prestito allo Standard Liegi" (in Italian). Retrieved 1 February 2019. ^ "Presi Cotticelli e Sinani, ceduto Chirullo" [Cotticelli and Sinani signed, Chirullo transferred out]. ssjuvestabia.it (in Italian). Società Sportiva Juve Stabia. 31 August 2018. Retrieved 31 August 2018. ^ "Comunicato ufficiale: le cessioni del settore giovanile" [Official statement: youth sector transfers]. acmilan.com (in Italian). Associazione Calcio Milan. 4 September 2018. Retrieved 4 September 2018. ^ a b Scott Murray; Paolo Bandini (27 May 2009). "Which clubs have retired shirt numbers?". The Guardian. London. Retrieved 11 January 2010. ^ "First team – staff". acmilan.com. Associazione Calcio Milan. Retrieved 29 November 2017. ^ Marco Conterio (21 July 2018). "Da Edwards a Li: Scaroni è il 23esimo presidente del Milan". tuttomercatoweb.com (in Italian). Retrieved 20 August 2018. ^ "Tutti gli allenatori rossoneri". ClubMilan.net. Milan Club Larino. 25 July 2007. Archived from the original on 24 December 2008. Retrieved 14 January 2010. ^ "AC Milan acquire A.C.F Brescia sporting rights" (Press release). A.C. Milan. 11 June 2018. Retrieved 12 June 2018. ^ a b 官方：李勇鸿成为AC米兰俱乐部第22任主席. 体坛+ (in Chinese). 14 April 2017. Retrieved 28 March 2018. ^ "L'Assemblea dei soci nomina il nuovo Consiglio di Amministrazione di AC Milan S.p.A." (in Italian). A.C. Milan. 14 April 2017. Retrieved 15 April 2017. ^ "U.S. Hedge Fund Elliott Backs Deal to Buy AC Milan Soccer Club". Wall Street Journal. Milan. 28 March 2017. Retrieved 11 October 2018. ^ a b "Berlusconi Completes Sale of AC Milan Soccer Club to Chinese Investor". Wall Street Journal. Milan. 13 April 2017. Retrieved 11 October 2018. ^ "Il Milan è solo di Elliott: le quote del club alla società del Fondo". La Gazzetta dello Sport (in Italian). Milan: RCS MediaGroup. 10 July 2018. Retrieved 11 October 2018. ^ "L'INIZIO DI UNA NUOVA ERA PER IL MILAN" (Press release) (in Italian). A.C. Milan. 21 July 2018. Retrieved 21 July 2018. ^ "Real Madrid stays at the top". Deloitte UK. 8 June 2007. Archived from the original on 14 June 2007. ^ "Deloitte Football Money League". Deloitte United Kingdom. ^ "Emirates and AC Milan Score New Sponsorship Deal". 5 December 2014. ^ "bwin". 1 February 2016. ^ "Automaker Opel Returns To Sports, Sponsors Four Bundesliga Clubs". 1 February 2016. ^ "AC MILAN AND ADIDAS EXTEND PARTNERSHIP". 10 October 2013. Archived from the original on 20 June 2015. ^ "AC MILAN AND ADIDAS TERMINATE THEIR PARTNERSHIP" (Press release). A.C. Milan. 24 October 2017. Retrieved 31 October 2017. ^ a b "2006 Bilancio" [2006 annual report] (PDF) (in Italian). A.C. Milan. Archived from the original (PDF) on 25 April 2011. ^ "Sheva segna ancora nel Milan". Il Sole 24 Ore (in Italian). 27 April 2007. Retrieved 21 April 2018. ^ "2007 Bilancio" [2007 annual report] (PDF) (in Italian). A.C. Milan. Archived from the original (PDF) on 25 April 2011. ^ a b "2008 Bilancio" [2008 annual report] (PDF) (in Italian). A.C. Milan. Archived from the original (PDF) on 14 May 2013. Retrieved 5 August 2011. ^ "Bilancio da retrocessione scudetto costato 70 milioni". La Repubblica (in Italian). 29 April 2011. Retrieved 21 April 2018. ^ a b c "2010 Bilancio" [2010 annual report] (PDF) (in Italian). A.C. Milan. Archived from the original (PDF) on 15 May 2012. Retrieved 5 August 2011. ^ "2011 Bilancio" (PDF) (in Italian). A.C. Milan. Archived from the original (PDF) on 16 June 2015. Retrieved 1 June 2015. ^ a b "2012 Bilancio" [2012 Annual Report] (PDF) (in Italian). A.C. Milan. Archived from the original (PDF) on 1 May 2015. ^ a b "Plusvalenze 2013, dati e curiosità sulle cessioni che hanno generato profitto". milannews.it (in Italian). Tutto Mercato Web. 17 April 2014. Retrieved 21 April 2018. ^ a b "2013 bilancio" (PDF) (in Italian). A.C. Milan. Archived from the original (PDF) on 1 May 2015. Retrieved 2015-05-28. ^ "Bilancio Milan più rosso che nero: -15 milioni nel 2013, -50 a giugno". goal.com (in Italian). 17 April 2014. Retrieved 21 April 2018. ^ "Milan, bilancio in rosso: Berlusconi ripiana". Il Sole 24 Ore (in Italian). 16 April 2014. Retrieved 21 April 2018. ^ a b "CAS 2018/A/5808 AC Milan v. UEFA" (PDF). Court of Arbitration for Sport. 1 October 2018. Retrieved 11 April 2019. ^ "CFCB Adjudicatory Chamber renders AC Milan decision" (Press release). UEFA. 14 December 2018. Retrieved 11 April 2019. ^ "BILANCIO IN ATTIVO" (Press release) (in Italian). A.C. Milan. 27 April 2007. Retrieved 1 July 2012. ^ "Il Milan approva il bilancio 2007" (Press release) (in Italian). A.C. Milan. 24 April 2008. Retrieved 1 July 2012. ^ "Bilancio 2008 approvato" (Press release) (in Italian). A.C. Milan. 26 April 2009. Retrieved 1 July 2012. ^ Written at Milan. "Milan: bilancio 2009 perdita 9,8 milioni" (in Italian). Rome. Agenzia Nazionale Stampa Associata. 23 April 2010. Retrieved 1 July 2012. ^ "IL MILAN APPROVA IL BILANCIO 2010" (Press release) (in Italian). A.C. Milan. 20 April 2011. Retrieved 1 July 2012. ^ "IL MILAN APPROVA IL BILANCIO 2011" (Press release) (in Italian). A.C. Milan. 20 April 2012. Retrieved 1 July 2012. ^ "Bilancio Milan: gli impegni di Yonghong Li e il debito verso Elliott". Calcio e Finanza (in Italian). 1 November 2017. Retrieved 18 December 2017. ^ Pollina, Elvira (31 October 2017). "AC Milan, bilancio: da analisi covenant prestiti no criticità, fiducia in rinegoziazione debito". Milan. Reuters. Retrieved 18 December 2017. ^ a b c d e Relazione e Bilancio al 30 giugno 2018 [Annual report and financial statements [for the conditions] at 30 June 2018] (PDF) (Report) (in Italian). A.C. Milan. 2018. Retrieved 11 April 2019. ^ a b "Milan, rosso da record nel bilancio: -126 milioni di euro". La Repubblica (in Italian). 12 October 2018. Retrieved 11 April 2019. ^ a b c "Il Milan chiude il bilancio 2017-2018 in rosso di 126 milioni". calcio e finanza (in Italian). 12 October 2018. Retrieved 11 April 2019. ^ Fassone, Marco (March 2018). "INFORMATIVA AGLI AZIONISTI DI ASSOCIAZIONE CALCIO MILAN S.P.A." (Press release) (in Italian). A.C. Milan. Archived from the original on 28 March 2018. Retrieved 28 March 2018. ^ Fassone, Marco (May 2018). "AGGIORNAMENTO DELL'INFORMATIVA AGLI AZIONISTI DI ASSOCIAZIONE CALCIO MILAN S.P.A." (Press release) (in Italian). A.C. Milan. Archived from the original on 5 June 2018. Retrieved 5 June 2018. ^ "Doornbos joins Superleague series". Autosport. Retrieved 1 August 2009. ^ "Superleague thrilled to add Pantano". Autosport. Archived from the original on 25 June 2009. Retrieved 1 August 2009. Wikimedia Commons has media related to A.C. Milan. Look up Milan in Wiktionary, the free dictionary.